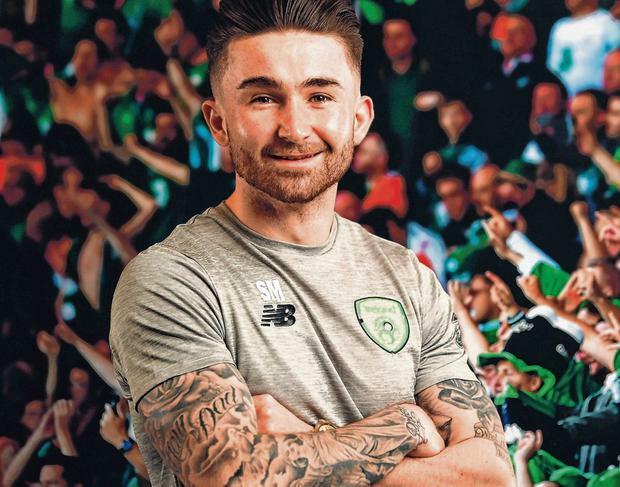 He is only 24 years of age, but Seani Maguire is already resigned to the fact that he will spend the rest of his career operating off a different weekly schedule to most footballers. That is the consequence of four hamstring injuries in the space of a year, a problem which Preston doctors have linked with his explosive playing style. He smiled earlier this week when he read how Mick McCarthy's comments on Maguire sitting out Monday's training session were interpreted. Ireland have taken guidance from Preston on how to manage the front man's workload. "I've seen it said that Seani Maguire takes Mondays off," he sighs. "It's not like I don't like Mondays and only start training on Tuesday. "I'm in at 9.0 most mornings and in the gym for 45 minutes before every training session and I'll probably have to do that now until the day I retire. "It was frustrating but I've got used to it now. Just being in the gym on my own getting my legs warmed up before we go out. "Preston were looking at my stats throughout the week and I particularly do a lot of running in training. They've even said to me to kind of chill out sometimes. But I train the way I play so I can't chill out. "So the best thing to do is take Monday off, train Tuesday and Wednesday. Our day off is Thursday, so train Friday, game Saturday." That's the pattern he has followed this week, and Maguire is hoping to earn a first competitive start at the Victoria Stadium tomorrow. On form, he's a fair shout for selection with a prolonged run in the Preston side lifting his spirits, especially since he was switched from the left side to his preferred No 9 slot. His last game culminated with a 90th-minute header to defeat Birmingham, a crucial victory for the unlikely playoff contenders who have jumped up from the bottom half of the table after hitting form at the right time. Regular observers of North End say it's no coincidence that Maguire's return has run in tandem with the upturn in fortunes. The fact that he was on the end of the pitch for the conclusion of the Birmingham match was particularly satisfying given that he was becoming accustomed to seeing his number come up on the substitution board due to concerns about his well-being. Preston were happy for Maguire to come away this week, yet the quick turnaround to Georgia on Tuesday might be the main obstacle to the ex-Cork City player taking the field from the outset for Mick McCarthy's first match back in the dugout. The artificial surface in Gibraltar is another consideration too. "I feel I'm not back to my 100pc best," Maguire says. "But I feel like I'm getting there. It (playing 90 minutes in both games) would be realistic. "I've started the last 10 games and played five 90 minutes so there's no doubt in my mind that it would be realistic because we've had two or three big weeks." "I feel this is a good opportunity for myself to keep my confidence up. It's another box to tick." He was anxious to make a good impression on Mick McCarthy and an extra bonus was meeting Robbie Keane for the first time after admiring from afar. Ireland's record goalscorer has offered a few pointers already about movement and the confidence-boosting potential of games such as the Gibraltar test. Maguire made his first Irish start in Turkey a year ago this month, yet there's a sense that he doesn't really feel that his Irish international career has kicked off yet. The high point was probably the massive Aviva Stadium ovation he received for his late cameo against Moldova at the tail end of the World Cup campaign. "It could be a great opportunity in the next couple of games to score my first goal for Ireland," he continues. "When I put the Irish jersey on, I haven't really done myself justice. I haven't played particularly well. "I know I've only had one start, and had a few cameos here and there. "This could be the couple of games where I could kick on. I'm ready. And I'll relish the opportunity to put the jersey on, and hopefully hold on to that No 9 jersey." The interactions with Keane would suggest he's firmly in the management's plans. "We were playing 11 v 11 in training on Tuesday and afterwards he came over to me and told me what I did right and what I did wrong, and what I could be doing better. "On the Monday, he was in the boxes with the boys and they were saying he didn't give the ball away once! But for a player like that to be telling me stuff, I'm always going to listen to him. "He's given me lots of advice in the past few days. "Most of Robbie's goals were one touch, two touches. You get most of your goals in the 18-yard box and I suppose I need to go on from that." That said, Maguire is not going to shout from the rooftops about filling the void left by Keane's exist. "I'm a goalscorer," he says. "So I back myself to score goals given the opportunity. "For people to compare me to Robbie or put me on a par with Robbie would probably be a bit unfair to me because Robbie proved himself as a world-class player and a world-class goalscorer." Just one Irish goal would mean the world to Maguire for now. But he's already driven by the desire to make up for lost time.